When an employee or dependent applies for a life or disability amount above the guarantee issue (GI), an Evidence of Insurability (EOI) is needed. Insurance carriers can take months to review and approve an EOI and they may request additional information from the employee directly, such as blood or urine analysis. Due to the extended time frame and sensitive information involved, it is difficult to follow up on the status of these requests. To help with this, we now have a process in Zenefits where the employee is prompted to submit their EOI to the carrier directly and, when the company administrator sees a change on the invoice, they are able to update the information through their Zenefits dashboard. 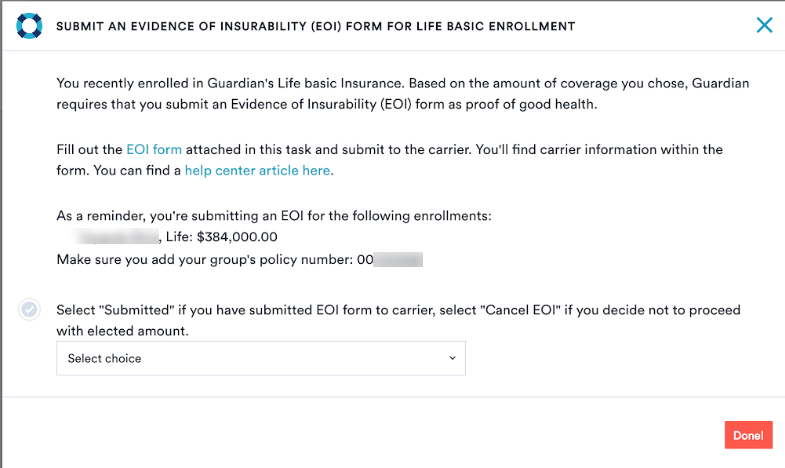 Upon completion of the life or disability enrollment, Zenefits will send an inbox action to the employee, instructing them to submit an EOI to the carrier. Once the employee sends the EOI, they can mark the inbox action as "Submitted". If they decide not to submit the EOI, they can select "Cancel EOI" and click "Done". The action taken by the employee will update the EOI status in the Event Log. 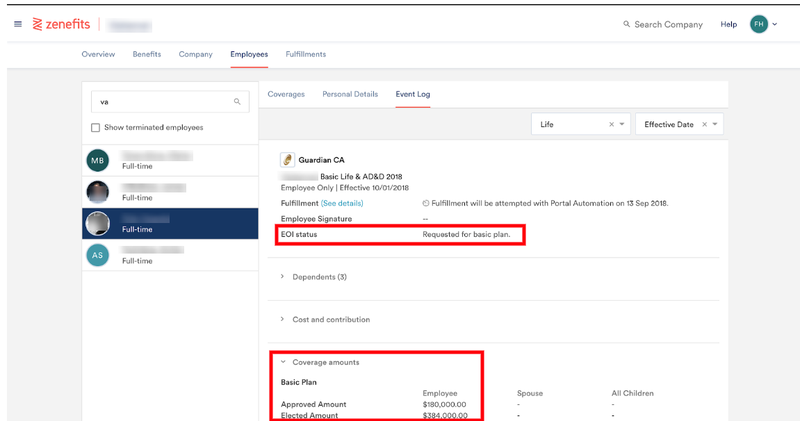 Once an employee completes the inbox action as "Submitted", Zenefits will send reminders to the administrator until the EOI has been approved and the information has been updated in the employee's account. Instructions on how to update the benefit amount in the employee's overview page can be found here.